A new collaborative study from more than twenty pediatric emergency departments around the U.S. has described results for measuring patterns of RNA expression from blood samples that can enable clinicians to distinguish bacterial infections from other causes of fever in infants up to two months old. The findings from the new study, published recently in JAMA through an article entitled “Association of RNA Biosignatures With Bacterial Infections in Febrile Infants Aged 60 Days or Younger,” describes a high throughput RNA analysis that yields specific markers known as RNA biosignatures. The new diagnostic test means emergency department physicians could someday avoid ordering painful, invasive exams for many of the more than 500,000 febrile infants who arrive at hospitals each year and must be evaluated to determine whether a bacterial infection is the cause of their fevers. Results that indicate no bacterial cause would also help reduce unnecessary hospitalizations and antibiotic treatments. The current protocol for evaluating young febrile infants calls for culturing bacteria from blood, urine, and cerebrospinal fluid samples. Cultures typically take 24 to 48 hours to determine if bacteria are present. The tests, while effective, are invasive and can be painful for young patients as well as stressful for parents. Testing also is costly, involves some degree of clinical risk and may require hospitalization, all of which pose difficult questions for pediatricians and emergency department physicians who do not want to miss an acute infection. While the RNA biosignatures approach has been shown to be valuable in detecting certain infections in older children and adults, the current study is the first to show that the test could also be used in very young febrile infants. 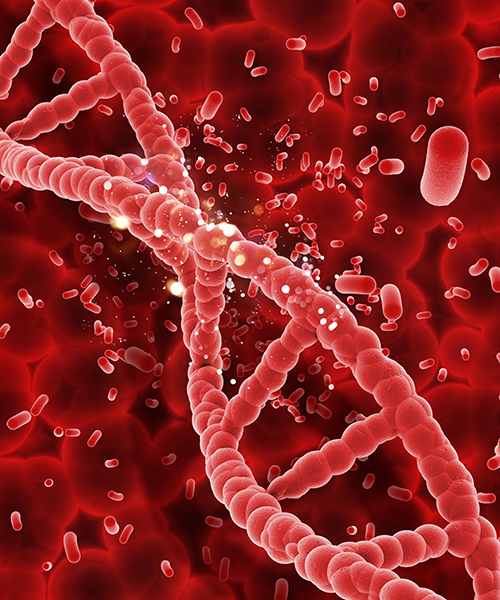 Some physicians and researchers had concerns that RNA biosignatures would be ineffective for this patient population since the immune cells in the blood of these youngest of patients were too immature to mount a detectable response to bacterial infection. In contrast to blood cultures, an RNA biosignature assay requires only a small amount of blood to detect immune system responses to pathogens. DNA within white blood cells are prompted to produce different RNAs according to environmental cues—the first step toward making proteins that are essential for keeping the cell functioning and able to cope with changes in the surroundings. The prospective study was conducted with infants 60 days or younger with fever (defined as having a rectal temperature of at least 38°C/100.4 °F). RNA biosignatures were measured on a selected group of 279 infants, of whom 89 were determined to have bacterial infections. Nineteen healthy babies with no fever served as controls. The investigators found that RNA biosignature testing was highly sensitive and specific for categorizing patients with and without bacterial infections when compared with the current standard using bacterial cultures. In infants who had bacteremia (bacteria in the blood) the test had 94-percent sensitivity. For febrile infants whose fever was not caused by bacteremia, the RNA biosignature analysis agreed with the negative culture 95 percent of the time. For all cases of severe bacterial infections, which included bacteremia, meningitis, and urinary tract infections, the RNA biosignatures test had an 87 percent sensitivity for detecting bacterial infection and an 88 percent specificity for infants without bacterial infection when compared to the standard culture results.